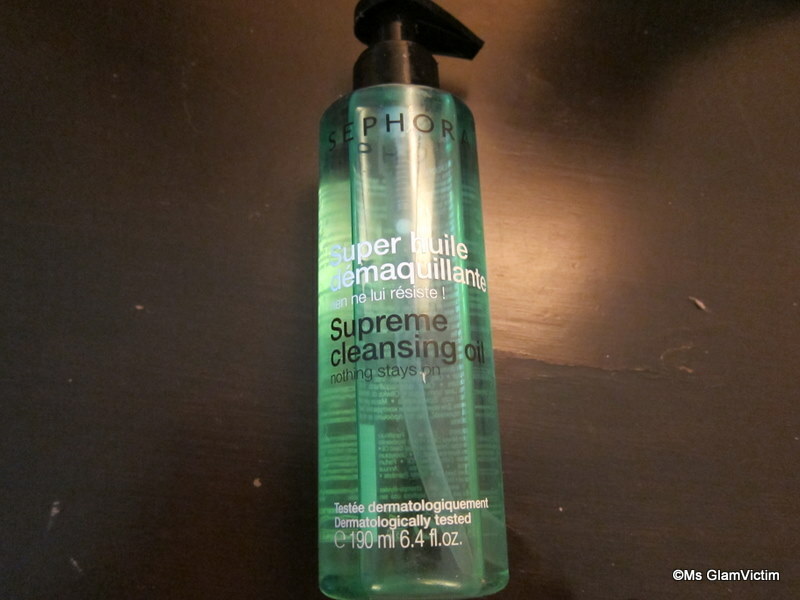 I will be reviewing the Sephora Supreme Cleansing Oil today. Price: Rs. 800/- for 190 ml or 6.4 fl oz. There has been a current rage about using oils on your face for moisturizing, removing makeup, etc. Following the rage, I thought of trying the Clarins Lotus Face treatment oil on my OILY face. So I picked up a sample from the Clarins counter. Yes, I know I sound crazy using oil on my oily skin, but let me tell you it is Amaaaaaaaazing!! Thinking of purchasing the full-size bottle. Coming back to the review, I was really fascinated by the the whole oil concept so I picked it up. This product has a tag line “Nothing Stays on” , and that is definitely true. Here is an ingredient list. I hope its legible. Taking a picture here was a challenge. The product comes in a simple and functional packaging, with a pump. What I did was, that I squirted two pumps on my hand and started to massage it on my face. It feels like any other oil. Then, I wet my hands and started massaging my face again, and I was really shocked to see that this oil magically turns into a lotion!! I just massaged this lotion on my eyes, face and lips. Then I washed it with lukewarm water, and viola, everything was gone. No makeup remover ever made my skin looking so clean. It was incredible. All my eye makeup, including eyeliner on my waterline, completely disappeared. 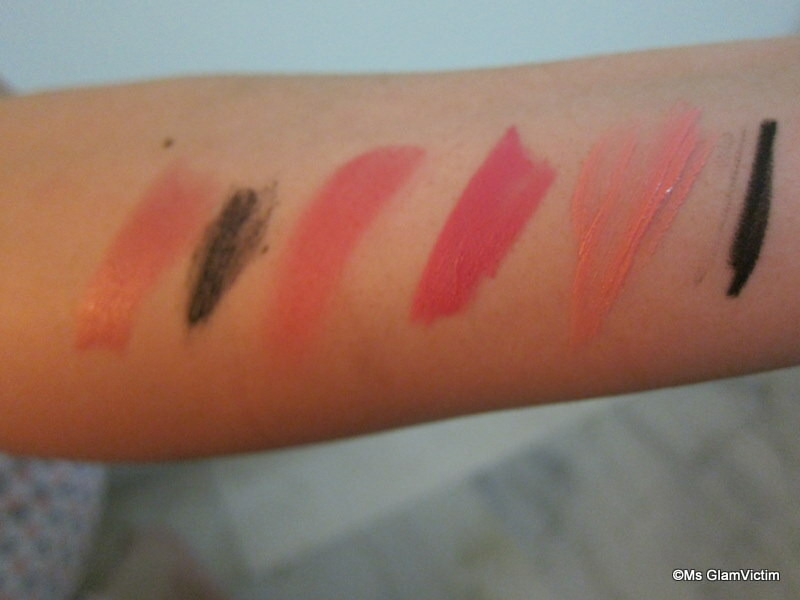 I tried to give you a demo of how good it is at removing makeup. Here I have some waterproof eyeliner, waterproof mascara, lip stain, regular lipsticks & cream blush. Here with 2 pumps of the product. This looks like I burned my hand, GROSS!! Anything for the sake of a demo!! It totally removed everything even before I added water to it. Now adding water to it, turns the oil into a lotion and completely removes everything. This makeup remover is very moisturizing, it does not dry out the skin at all. But it does leave a slight oily feeling later, that’s why I use my Clarins face wash after using this to remove any oil residue. But I guess, dry skin girlies can skip that. The only downside I feel is, that you cannot use cold water to rinse this off. The first day I used it, I used cold water and the oil just won’t come off. But warm water removes it without any hassle. Just a small pointer there. Does what it says on the bottle. Nothing stays on!! and I mean NOTHING!!!!!!! Has a mild fragrance. Nothing very overpowering. 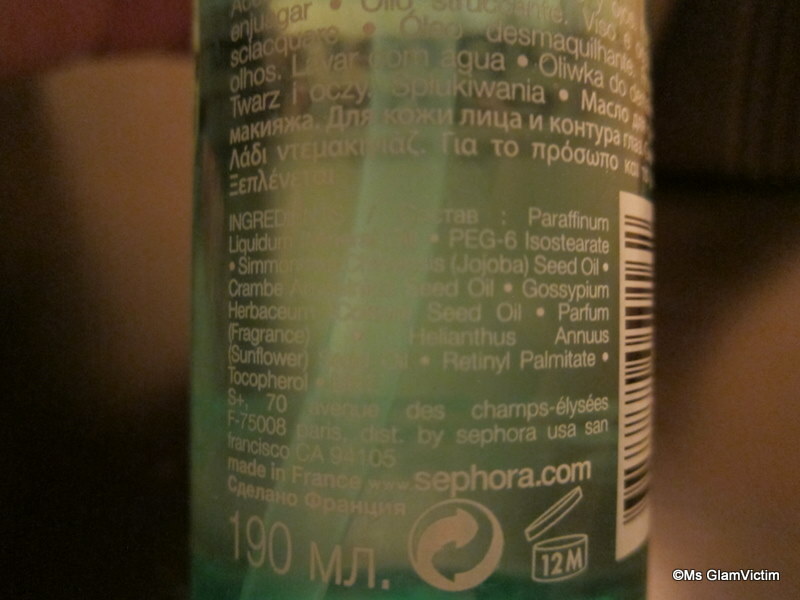 I find it decently priced compared to a few high-end makeup removers who do a similar job. Have to use only warm water to rinse it out afterwards. But this doesn’t bother me much. Available only at Sephora counters. Summing up, this product has become my HG makeup remover for now. Give it a try! It won’t disappoint you.